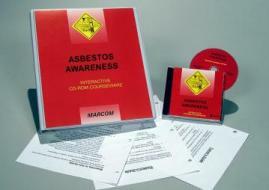 MARCOM's "Asbestos Awareness" Interactive CD-ROM Course educates employees about the hazards of working with materials that may contain asbestos. The course provides the majority of the information needed to satisfy the training requirements for Class IV employees under the OSHA regulation. In August of 1994, OSHA issued 29 CFR 1910.1101... "Occupational Exposure to Asbestos." This regulation requires that all employees who could come into contact with materials that might contain asbestos be given appropriate training on working safely in these situations. The largest group of employees covered by this regulation are maintenance and custodial workers, since many materials commonly used in buildings for many years (including ceiling tiles, vinyl flooring, and wall and pipe insulation) contain asbestos. This means that the regulation applies to virtually every custodial, janitorial and maintenance worker in the country. Areas covered in the course include the hazards of asbestos, OSHA's Asbestos Standard, the composition and nature of asbestos, materials that may contain asbestos, and where they are encountered, limiting exposure to asbestos, protect yourself when disturbing a material that may contain asbestos, special considerations, such as air monitoring and decontamination, and more. Using a powerful combination of audio, full-motion video, text and colorful graphics, this course provides the most cost-effective safety and regulatory compliance training available today. The course is divided into a number of logical sections so information is easily understood... and retained. Also designed with the training manager in mind, all courses in the Interactive CD-ROM Training Library include a learning management system (at no additional cost). Using this system, trainers can set up "Pre" and "Post" tests... establish log-in procedures... even define and set up curriculum for various job classes. The system also collects and organizes employee performance information through a powerful relational database, which can generate a number of record-keeping and tracking reports... and has a database "import/export" feature, which allows information to be transferred to and from an external database (such as a company's personnel database). The course is one of over 100 titles currently available in the Interactive CD-ROM Training Library.